Information Articles - What Brands Will Be Registered - Ownership Identification Inc.
1. The basic design will consist of a combination of characters (numbers and letters) and symbols, with at least two being used. The symbols that can be used are quarter circle , rafter , half diamond , bar , slash , box , triangle or diamond . 2. It is important that the design can be easily read by the inspectors. As well, the brands must be able to be described verbally. 4. Blotching of brands is a problem. As a result characters within symbols are not allowed. Certain connected characters also cause problems, e.g. , , , and will not be registered. 5. The following letters can be used in the reverse position: B, D, F, G, K, R.
6. The following letters can be used in the lazy left or right position: A, B, D, E, F, H, M, P, R, S, T, U. 8. No letters can be used in the inverted reverse position. 9. Written or Script letters will not be registered. 10. All numbers must be in the normal vertical position. 11. Quarter circles will be registered with the ends pointing away from the brand character. 12. Rafters will be registered with the ends pointing toward the brand character. 13. Half diamonds will be registered with the ends pointing toward the brand characters. 14. Three character brands will be registered in the rib position only. i.e. COW. 15. Cattle brands can be registered in six positions: left and right shoulder, left and right rib and left and right hip. 16. 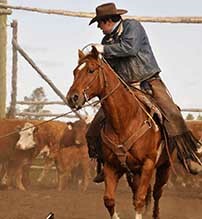 Horse brands can be registered in four positions: left and right shoulder and left and right hip. 17. Bison brands can be registered on the left or right hip. 18. 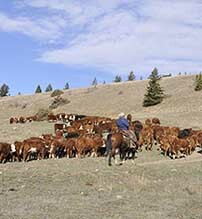 Single character brands may be issued for feedlot operator's use only. Brands that are currently registered that do not conform with this policy will not be taken out of use provided they are always renewed on time or legally transferred. Should a brand that does not conform be allowed to expire, it will be removed from the Brand Registry and not be reissued. The above Policy will be rigidly followed so that brands can be easily read by the Livestock Inspector, brands can be described in a simple verbal description and the whole brand structure be easily indexed by the computer.